Polpette - meatballs. Such a staple of American Italian food, and one which, for a variety of reasons, I am almost entirely unaccustomed to cooking. They remind me of my mothers kitchen, and the particular....sense she cooked with. That good and gentle care that speaks through food of love. The rituals of completion, the careful checking, the little nods and turns that are the unspoken language with which we season our food for the most important people in such particular ways. Rich with childhood memory, the very thought of the taste of them makes me feel good, secure and cared for. The basic and honourable Irish meatball.....minced beef. First,the meatballs, made in advance, to set and gather texture in the fridge. 1 medium onion, finely finely diced. 1 clove of garlic, also finely diced. 50g of cheese, grated, or finely diced. I used mozzarella, but the suggestions range from cheddar to gruyere, to parmesan. Mix everything together, fry off a little of the mix, and taste the seasoning - adjust as you want to - and form into small meatballs. Try not to tamp them together too hard. Meanwhile, put on your tomato sauce. Here's the one I used. But tomato sauces are as unique as fingerprints, as unique as the particular odour of mothers kitchens, each one distinct and separate. Some kitchens cinammoned, some perfumed with the rank sulphur of cabbage, some with umami warmth and generosity. This sauce works fine. 1 medium onion, finely diced. 2 cloves of garlic, finely diced. The sugar and vinegar combination is to give a slight, slight agrodolce edge to the sauce - sweet and sourness. To boost it, add more of each. Or replace the vinegar with white wine. 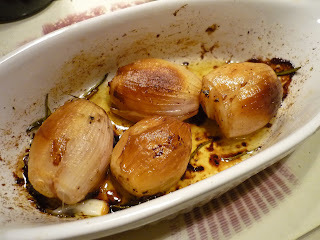 Sweat the onions and garlic in oil until golden. On a low heat. If they brown, the garlic especially, the bitter notes can compromise the end sauce. Add the wine vinegar, and bring it up to the simmer, and allow most of it to evaporate, adding the sugar as it bubbles. Add your tomatoes, salt and pepper, and set on a slow cook on the hob top, stirring occasionally to loosen it up. Keep the heat low, allowing the sauce to concentrate itself. After a generous hour or so, take your meatballs from the fridge. Heat a pan with oil - a deep pan, large enough to take the meat and the sauce. 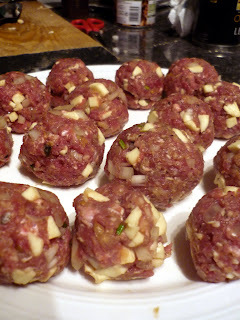 The meatballs need to have some space to roll around, and not be too crowded - they all need pan contact, in one layer. Fry off your meatballs quickly, to brown them. The outsides will develop those lovely Maillard reaction flavours, while the insides, because of the fridge chilling - should remain cool, giving you the best of both worlds. The outside gets those yummy flavours, and the insides stay soft and untough. Lower the heat after a couple of good shuggles - a minute or two is good here, and pour in your tomato sauce on top of the meatballs. Cover, and cook on a low heat for another 20 minutes or so. The sauce takes on the delicious depth of the meat, allied to a tomatoey sweetness, that just bearhugs you happily. We served it with homemade tagliatelle (pasta recipe here, video here), giving acres of roughly edged pasta real estate for the sauce to gloopily cling to. Meatballs, with tomato sauce. Glorious. 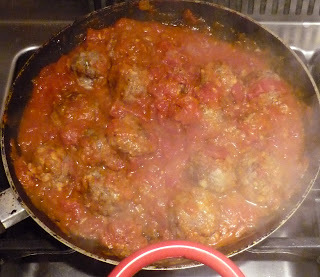 Oftentimes the addition of onions to meatballs can lead them to brown, carbonise and become bitter. I'm still divided on their inclusion. Because when they do turn bitter, the dish is compromised. Here, the fine dicing seemed to work well. As did very quick frying. Posted by Keith at 8:00 p.m. Picked up two trotters at the local butchers for the princely sum of €1.50. Being on the dole certainly fosters fiscal creativity. 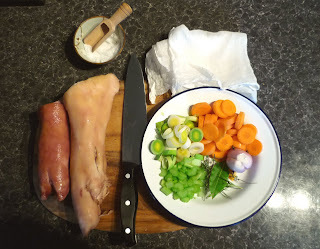 More to the point, having been utterly inspired by Fergus Henderson's (video link) Nose to Tail Eating cookbook, and fantastically charmed by the man himself, I've found myself with enough time to actually do something constructive with this porcine culinary crush. Also, and equally to the point, the environmental cost of meat eating does weigh on my mind. I eat vegeatarian meals with more regularity than most omnivores, I think, and consuming the whole beast when one does eat meat is yet another almost imperceptible nod towards sustainability. 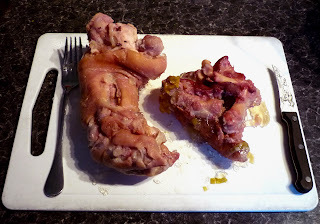 Pork Trotters. This preparation is amongst the most basic. It's first up in Grigsons chapter on feet, and serves as the basis for other, more complicated preparations - Saint Menehoulde (braised, then breadcrumbed and finished off and crisped in the oven, grill or fried), stuffed (with forcemeat or truffles), or crumbled trotters. Add all the ingredients to a pot, pour in water to just cover it, bring just to the boil (again, too high a temperature will topughen the meat), and simmer. Grigson suggests 6 hours - perfect if you have a wood burner of solid fuel stove heating the house - but on gas I went for 2 and a half. Posted by Keith at 9:21 p.m.
My journey deeper into the gelatinous underworld of pork love continues. Picked up some trotters to experiment with pieds de porc/pieds de cochon from Grigson's Charcuterie (great book.....to be reviewed). For today, a braised pork belly, Asian style, with a braised Chinese cabbage to balance the meltingly fatty and deep lusciousness of a carefully braised belly. Braising has been an absolute revelation for all at Chez K. The low temperatures make luscious plates of even the most unpromising of cuts. The cockerels we dispatched in the earlier part of the year, older than ideal, and entirely free range, were tough when roasted, but responded fantastically to our Moroccan tagine (A Moroccan braise, essentially) and French style Pot au Feu preparations. The meats and fat becomes meltingly soft, the braising liquid ensures a juicy juicy dish, and the inclusion of aromatics, herbs and spices penetrates deep into the flesh of the dish, as it bubbles away unattended in your oven or on your stovetop. Stock ( Veg or chicken is good) or water if you have no stock. I found 1.25l was more than ample. Cut your pork belly into the portion sizes you prefer - generally, recipes call for roughly1.5 or 2cm thick slices. I simply cut my piece in three. 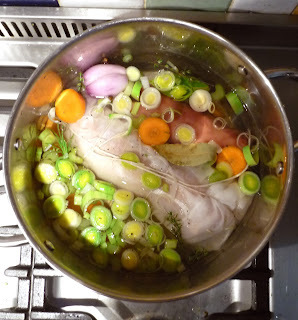 Combine all the ingredients in a large pot (the stock/water should just cover the pork belly). 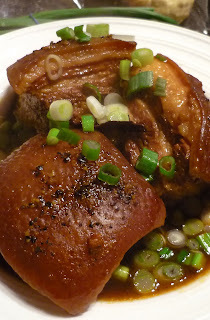 With a fatty pork dish something acidic on the side really underpins the flavour and gives it a completely moreish feel. Vinaigrette, sauce gribiche, caper based sauces, all are classic and acidic pork accompaniements. This braised cabbage dish below is both sweet and acidic, and the cooking apple gives a nice lifting tartness, which feels like it opens up the tastes buds to fully appreciate the meat. It even worked for the gorgeous C (sadly lacking in the love of pork.....) served on the side with some baked bass. Gently fry the apple and onion in butter for 5 minutes. Add everything else, and mix thoroughly - the pot will be full with leaves, but they will reduce. Braise for at least an hour - longer if you can, on the stovetop on a low heat. Stir occasionally. Posted by Keith at 10:20 p.m.
12% optional service charge included. Pro’s: Everything. Service, price, atmosphere, food. Cons: Slight oversalting, to my palate (on the veloute, pithivier, and chicken). Is cucumber jelly a one taste pony? Summary: Bargain. Absolute bargain. Wonderful service. Relaxed ambience. Michelin quality food. At a cheap, cheap, cheap price. Ditch Carluccios, Avoca, and go for this. It’s the best quality to price ratio I’ve found so far. Having recently swelled the ranks of the unemployed, the Luscious B invited me out for a celebratory/commiserating nosh up at the famed L’Ecrivain, hoping that poking my gob into a Michelin starred nosebag would cheer me up somewhat, popping my Michelin cherry incidentally as we went. The dining room is spacious, subtle, and well decorated, the space feels welcoming, neutral, and unthreateningly adorned. The space between tables is generous-spirited, and ample, in stark contrast to the hemmed in cattle-pen type troughery on offer in other parts of the city. It’s a pleasant space to spend time in. Unthreatening is a curious choice of words, but I’ve never managed to entirely shake off that Blackpitts born sense of unhomeliness in places where the waiter helps you out of your coat, and your bags are slickly and unknowingly stowed for you. Places where the waiters are better dressed than I am. The service, from greeting to goodbye put me entirely at ease. A sparkly eyed Eastern European waitress obviously happy in her work, enthusiastic about the food, and our appreciation of it, and knowledgeable about the plates on offer sealing the sense of entitlement that settled me comfortably into the role of high rolling customer. It helped that some people were dressed quite informally, and that the room was in no way dominated by the pin stripe suit brigade. With those weirdly elongated narrowed not quite pointed patent shoes so popular with the cheaper suited variety. As we struggled gamely with the more arcane aspects of the menus (the Luscious B is a vegetarian, and was able to order from the vegetarian menu, and mix with the main menu, with no issue), and ordered, the complimentary veloute arrived, in white coffee cups, caparisoned with a coconut milk froth. The veloute was mildly and carefully spiced, and designed to complement the froth perfectly, the serving cup ensuring that a morsel of cappuccino like froth was ingested with every delicate slurp. Delicate, careful, and fastidious, it was a perfect introduction to the rest of the meal, and marked out the dining experience as one entirely other to the standard mill of adequate afternoon eateries busy city dwellers abide with. Somebody had though carefully about this this, and loved it enough to make us do the same. The main course, served with a side of braised cabbage, and boiled potatoes (how can boiled potatoes be quite that vibrant, quivering little cushions of carbohydrate light, amazing things, alive with taste, meltingly soft......an angelic spud of a thing) was chicken, so succulent and soft it may have been sous vide, with a beef jus, mushroom veloute, and trompette mushrooms, served with a light horseradish aioli. The combination of tastes was intelligent, horseradish and beef as classic combinations, the beef jus bring out the umami of the mushroom veloute, and the trompettes atop singing clearly that baritone mushroom flavour that was the rhythm of the dish, and concentrated my palate on savouring the combinations. The chicken, juicy, beautifully cooked, the skin soft, salted, and echoing the umami flaours that unified the dish. I stopped talking. I looked into space. I may have shed a tear for what I thought chicken had been. I was gloriously depressed at my own efforts in the kitchen. I thought about every bite I ate. Carefully. It was emotional. Even the memory of it is making me dewy eyed, and nostalgic. It was “A Moment”. It’s a must. At €25 a pop, it’s Michelin starred madness. If you love food, love the recession. Because with deals like this, you’ll eat better than you ever have. Well. An afternoon at Carluccios’ will set you back the same, and you’ll walk out with the same feeling that the people preparing your food put into it - lethargic, uninspired, and slightly exploited. For the quality, the deal is fantastic. Go now. It’s the most quality packed €25 you‘re likely to spend this decade. Posted by Keith at 3:10 p.m.
OK....so, now that idleness has thrust it's happy self upon me, thank you credit crunch, financial wizards, Wolfean Masters of the Universe, and lax city regulation....I've some time on my hands. Several months worth of the stuff. And damned tricky stuff to handle it is too, I don't mind telling you. Daytime drinking only gets you so far. However, I don't miss the chest tightening terror that regularly and habitually gripped me at about 8:55 every weekday morning. The upshot is, I had planned a year of Cooking Dangerously. Set up a blog with that name. Two of them. Email. Whole shebang happily ticking over in my idle and naive bonce. Brawn. Chop up and en-pate-ify a hogs head (There's gotta be a joke in there about being redundant, and stiff upper lips....). Time to look my food in the face, as it were. Going to be quite challenging, that one. A smoker, and smoking. Tricky one this. oddities to issue forth from the kitchen Keith. Make cheese, both soft and hard. Butcher a carcass - probably lamb, and break it down. and inspiring man) Nose to Tail eating. Roast marrow bone's a must from that book. Posted by Keith at 9:41 p.m.